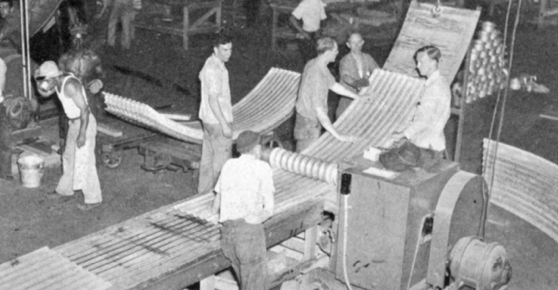 Corrugated iron was a key innovation in metalwork that came about in the early 1800s. Although prefabrication of frames was already a well-established concept, panel and spanning material were underdeveloped. Canvas or wood planking on top of iron trusses had been the traditional approach to roofing in most prefabricated buildings, including the Manning Cottage. The replacement of this system with corrugated metals, notably iron, and later the carbon and iron alloy, steel, meant that these buildings could be more quickly constructed, affordable and structurally sound. Corrosion presented problems until 1837, when many companies began to hot-dip galvanize metals for protection. Corrugated iron in portable buildings offered great potential, as the sheets could be nested in multiple layers (economical for transit) and could be cut into 3 ft x 2 ft panels easily carried by one person . This was especially important for building large numbers of these buildings, by relatively few labourers, without the aid of additional machinery. Corrugated iron used in housing kits was first widely used in the San Francisco Gold Rush of the mid-1800s, when all the people who came in search of their fortunes needed housing. Entrepreneurs publicly advertised these new housing kits to customers, who could then order and build themselves the shelter of their choice. These mass-produced corrugated iron buildings had a significant impact on the design of the Quonset Hut in WWII, which continued to use the large (easily handled) proliferated panels, though they were made of steel. The corrugated metal siding of the hut exterior was a very important production detail. The team wanted to orient the ribs of the corrugation parallel to the radius of the building in order to easily shed water. 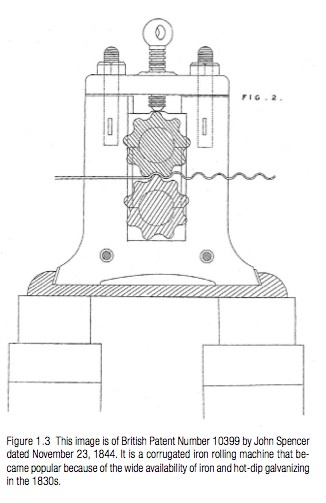 This unfortunately posed a huge problem for the production level, where the technologies of the time could only bend sheet metal in one direction, and bending the metal a second time, at an angle perpendicular to the first proved difficult. The problem was finally solved by a Fuller subcontractor, the Anderson Sheet Metal Company of Providence, which created a system of passing the sheet metal through large rollers multiple times . 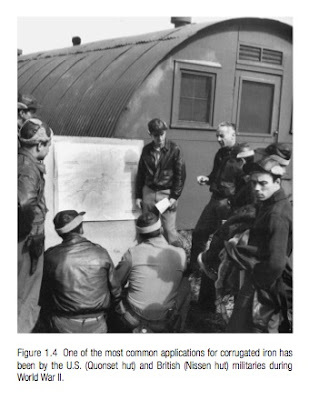 Corrugated iron and steel was an important invention, which not only greatly impacted the design of the US Navy Quonset Hut, but also fulfilled a need in economical, transportable, quickly-erected architecture. "Quonset Hut." Washington State DAHP, accessed December 1, 2012. http://www.dahp.wa.gov/styles/quonset-hut. This sheet matal your Blog post is very Nice and useful. Thank you fro sharing the infromation.